Have an article, announcement, photo or advertisement you want to submit for publication? Just click on the appropriate link below and follow the instructions. We’re happy to hear from you! 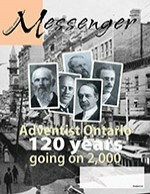 Announcements of minimal length are published at no charge for Canadian Adventist Members. They must fit one of the following categories: anniversary (50th and every 5 after), birth, birthday (90th and every 5 after), new member (baptism), obituary, and wedding. Here you can make a change to your Messenger subscription, or request a cancellation. Have an article, photo or other file you want to submit for publication? This is the place to do it. For Conference use only. Submit your campmeeting information.